The Maquech, “living jewel” of Yucatan whose origin and use go back to a legend of love, remains as a hallmark of the State for its economic and cultural impact, despite being neglected by the state authorities. Even with the modern advance and the so-called animal movement, the “Mayan beetle” continues in force from the presumed beginning of the tradition of carrying it and decorating it with jewelery and other materials in the late 19th century, during the Porfiriato period. Until today it is possible to find this “living jewel” decorated with rhinestones on its shell and thorax, and a chain that serves to attach it to clothes, (the maquech should be worn on the left side of the woman’s chest, where the heart is). Jesús Valentín Miss Domínguez, an independent specialist in Tropical Natural Resource Management, explained to Notimex that although an accurate anthropological report of the maquech is not known, some authors confirm that the ancient Maya already used the beetle as an ornament. These same studies indicate that its use had a boom during the times of the henequen (sisal) exploitation in the 19th century, which brought great wealth and prosperity to the region. This allowed luxurious transformations in everyday life, clothing and architecture in the Yucatán. 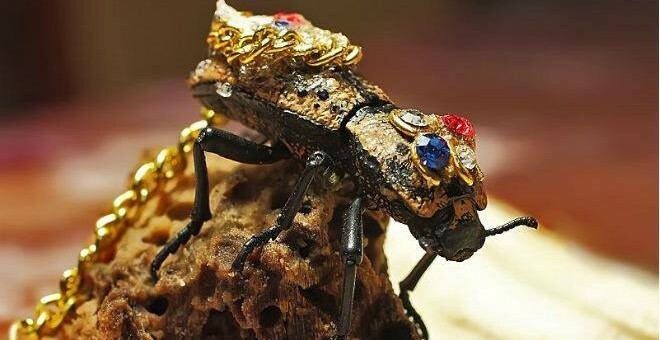 “At that time the beetle was adorned with stones considered precious; Over time, the maquech was marketed in a popular way and is now adorned with rhinestones, “he said. Today, in the XXI century, the insect is still sold in Mérida and other Yucatecan cities, mainly in points of tourist interest, such as the main market and other handicraft shops in the Historic Center of Mérida, such as the García Rejón Bazar and the Santa Ana Market. The specialist clarified that the species is not considered officially endangered, but the people who dedicate themselves to its collection say that each time they must go further into the forest to find the maquech, whose name, it is believed, comes from the Maya word má’akech which means “you are a man”. “Although there are populations in Yucatan and even in other places in Mexico such as Quintana Roo and Campeche, handling plans and sustainable management of the maquech are lacking, and authorities should be looking into this situation in order to preserve the species”, the expert said. In the case of Yucatán, there are reports of specimens collected in the municipalities of Progreso, Mérida, Conkal, Izamal, Tahmek, Hocaba, Xocchel, Sanahcat, Zavala, Huhí, Sotuta, Cantamayec, Yaxcabá, Tixcacaltuyub, Akil, Dzan, Valladolid and Tizimín. Regarding management in captivity, Miss Domínguez explained that there are no official regulations established for the proper care of this animal, but according to his experience, they can be kept in glass or acrylic containers. He also mentioned that in collaboration with colleagues from Guadalajara he performs tests on diets for the breeding and reproduction of the maquech, which can live up to five years in captivity (it is said that they feed from the bark of an specific tree, but this has not been scientifically proven). Regarding the weight of the rhinestones, Miss Domínguez stated that the beetle has the mechanical ability to distribute the load, which must not exceed the weight of the specimen, so it does not represent an extra effort for the animal.